With some social applications, comms apps and Microsoft services being phased out in 2019 and beyond, I thought a ready reference table of where Windows 10 Mobile stands would be useful. And I'll try to revisit this every few months to update each section as needed. In summary, there's likely to be a little disruption to 'normal' activities this year and a few more caveats in 2020, when Windows 10 Mobile will be out of official support. Anyway, see below for details! Yes, we're in an odd phase of the OS, where most of it still works (and is supported), but things are falling off the edges, as it were. Which means that it's hard to keep track of it all - hence the table below, which I'll keep updated every so often. Note that some dates are approximate, since even we at AAWP can't see into the future with certainty! 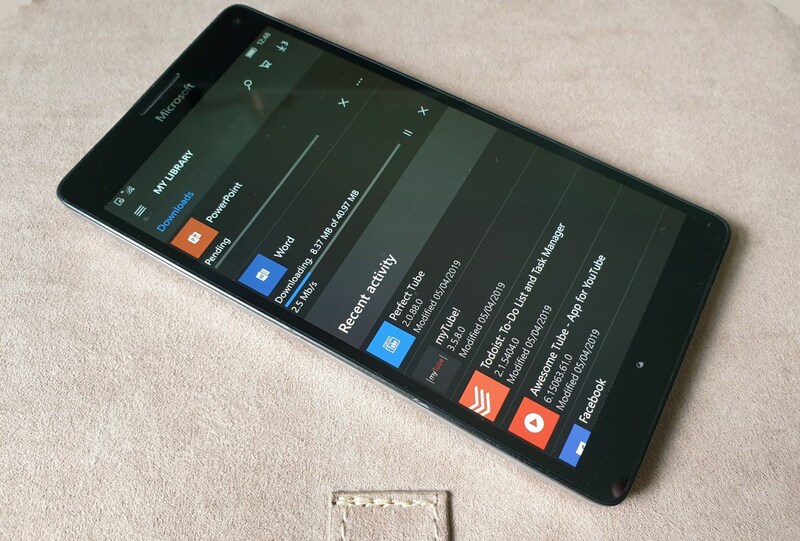 OneDrive music streaming Stopped from May 2019 onwards, at least from within Groove Music app. You can still stream or download from third party applications. Films & TV (aka 'Movies & TV') No cessation date announced, but several rumours. Clever money has new purchases stopping some time in 2019 and no access to past purchases stopping in 2020. Just a guess. Skype No cessation date announced, but it's 100% online and requires server integration, obviously, so I wouldn't be surprised if a date was announed later in 2019. Maybe March 2020? Facebook Messenger Official (Osmeta-based, derived from iOS codebase) client is being withdrawn at the end of April 2019. The solutions linked in the row above also include basic Messenger support, though. Apparently. Never used the system in my life! Instagram Official (Osmeta-based, derived from iOS codebase) client is being withdrawn at the end of April 2019. There are several third party alternatives, my favourite of which is Winsta UWP. Whatsapp The official WP8.1 client continues to work really well. No end date for support has been announced, I suspect it will be (at least) December 2019, as per Windows 10 Mobile itself. Telegram Plenty of options here, with an official 8.1 application that is gradually falling into disrepair, but also an official PWA that works well (though with no push notifications) and an actively developed third party app, Unigram UWP. Viber This messaging app has a first party UWP application, but reviews have been patchy - it's not actively updated. Ping me if you have more information - I've never used it! Spotify The official WP8.1 application still works, but is buggy as heck under the latest Windows 10 Mobile. I'd recommend the rather wonderful Spoticast Music UWP, though it cheats in terms of its music sources, which can be confusing. Still, it's gloriously bonkers and very pretty! Netflix The official WP8.1 application still works well, albeit slow to load video streams. It hasn't been updated for years though and (again) I wouldn't be surprised to see Netflix stop supporting it after Dec 2019. Amazon Prime Video Amazon has never had an official application for Windows phones, but if you're happy to fiddle a little in Edge then you can watch this on the go. It's not trivial though. Deezer There's a rather good official UWP client for this, so no need to look further. I'd expect this to work well into 2020, and possibly beyond. YouTube One of the more famous spats between Google and Microsoft, this hasn't had an official application for years, though of course it works fine in the Edge browser. I'd recommend myTube!, Perfect Tube or Awesome Tube though, all UWP applications with slick interfaces and all kept bang up to date. BBC iPlayer This has been browser-only for years under Windows phone and Windows 10 Mobile, but it's fine. The usual log into the BBC servers and you're in and watching. There's no downloading of programmes for watching later though, for DRM reasons. Do please let me know, by email or in the comments, if there are any inaccuracies in the above table or if you have information to update it. Thanks. Delivering a 'report card' for the status above is tricky. I'd say that the OS is completely viable still, with the obvious omissions (tap to pay, IoT support, online banking apps) that have been there for a while now. There are certainly enough workarounds and alternative applications for most people.